Your Zodiac Sign Compatibility report for 2017-2018 is available right here for you to enjoy. Find out how you and your partner will fare in love based on your zodiac signs. Star Sign compatibility is the number one interest around the world for millions of people that keep the astrologers very busy! Everyone wants to know if they should date that Scorpio guy or not. Everyone wants to know if their relationship will be fun with that Virgo girl. Should you invite that strange Aquarius guy to the party? Why is it that you seem to always attract The Twins? Will a Leo and Libra fall in love at first sight? Is it true that Taurus men can’t resist a Cancer woman? The questions about zodiac sign compatibility predictions are endless. There is so much truth by the real and honest experience of people that certain star signs match well while other can be a disaster. There are lots of myths out there, but then again, most of the tales are true. This is when you focus on sun signs only. It may be simple, but sometimes the simple truth is all you need when it comes to astrology compatibility. You might discover that for your sun sign, you should always avoid the Aries, and be on the lookout for Capricorns. Maybe a Libra is the zodiac sign that you have been missing when it comes to the most compatible sign for your next lover. Maybe you just need to find out why a Pisces and Sagittarius could be a match made in heaven. With this free online zodiac sign compatibility calculator, you will discover what your element is, your ruling planet, and what your lucky color, numbers, and days are. This report will also give you a list of the zodiac signs you are most compatible with and show you several famous people who share your star sign. You will get this same information for your lover. Your birthstone and your personality traits will be displayed in the results as well. Whatever your question is about zodiac sign compatibility, you will gain deeper insight with this love test. 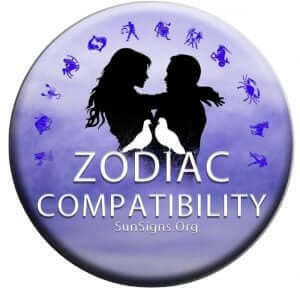 Horoscope compatibility will give you a detailed love report based on your sun signs. How both your negative and positive personality characteristics blend will be the major part of this reading. Understanding your sun signs and how they match up is the first step to discovering your unique way of maintaining a harmonious relationship.